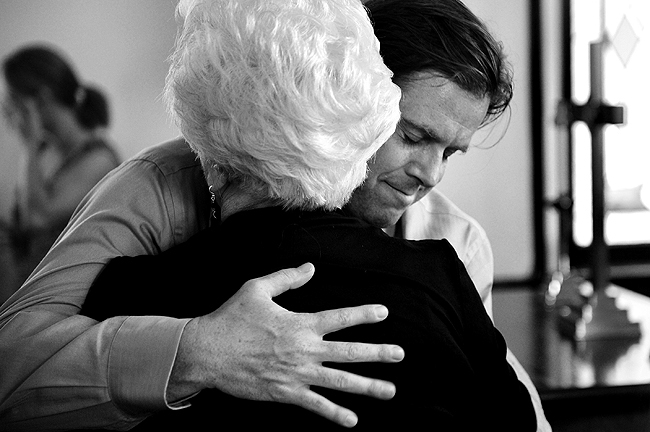 "Artist Tom Holdman is embraced by a supporter following his unveiling and explanation the significance of a stained glass window he created for The Community Presbyterian Church in American Fork, Wednesday, July 14, 2010." As of late, I've been doing a lot of stories on gifted artists. Tom Holdman was one of those people. Last week, he created and unveiled a stained glass window for The Community Presbyterian Church in American Fork. It was a pleasure to hear him speak about his passion of creating stained glass art for others and how his found his gift and started. When he unveiled the large window those in attendance stood on their feet, clapping and shedding tears of joy. Following the speech, it was amazing to see the passionate thank yous everyone gave to Holdman. And Holdman didn't simply brush it off, he received each handshake and hug with just as much respect and love back.